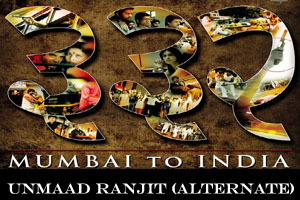 Lyrics Of Unmaad Ranjit (Alternate) From Movie - 332 Mumbai To India (2010): A song sung by Tauseef Akhtar & music composed by Shamir Tandon. Star Cast: Sharbani Mukherjee, Ali Asgar, Chetan Pandit, Vijay Mishra. Lyrics of "Unmaad Ranjit (Alternate)"
Lyrics in Hindi (Unicode) of "उन्माद रंजित (अल्टरनेट)"